Remington Drug Co., located in Remington, Va, has been combining high quality service with the latest advances in medications for the Town of Remington and surrounding areas since it’s establishment in 1913. Remington Drug Company is the oldest pharmacy in Fauquier County and Va Piedmont region north of the Rapidan river. In 1913, William Walden Ashby opened a pharmacy in a brick building on Main St that was previously occupied by A.W. Smith’s Dry Goods and Notions. 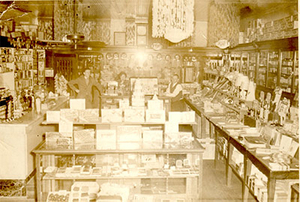 The pharmacy still operates in this location today. William Ashby died of the flu during the great flu pandemic of 1918 which resulted in his brother, Evan and Dr. George Russell Cottingham taking over the pharmacy. In 1944 Evan’s niece lost her husband in a hunting accident and was left with 2 sons, Wilbur & Robbie, to support. Evan invited his niece’s family to live in the apartment above the store with no rent being charged. Wilbur Heflin, the eldest of the 2 brothers, first started working at Remington Drug by washing dishes. In doing this, his admiration for his uncle and interest in pharmacy grew as he watched him operate the store and share his wisdom. At some point during those days, Wilbur decided on becoming a pharmacist and in 1972, he returned to Remington after owning a pharmacy in Idaho, to purchase Remington Drug from his uncle. Wilbur owned and operated the pharmacy for 43 years until transferring ownership to Travis Hale & Al Roberts on December 1st, 2015. Travis, a resident of Culpeper, has worked at Remington Drug since 2007. Al, a resident of Warrenton, has worked part time since the late 1970s and started full time in 2006 after the closing of Rhodes Drug Store in Warrenton. Remington Drug has been a fixture in the community for over a century, providing remedies, recommendations, and relief from the hustle & bustle while one sits at the marble soda fountain enjoying a scoop of ice cream or a milkshake.